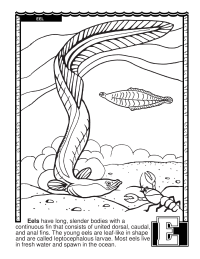 E is for Eel, from the Fishing ABCs Coloring Book. Created by the U.S. Fish and Wildlife Service. 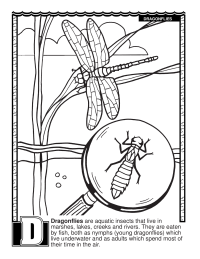 D is for Dragonfly, from the Fishing ABCs Coloring Book. Created by the U.S. Fish and Wildlife Service. 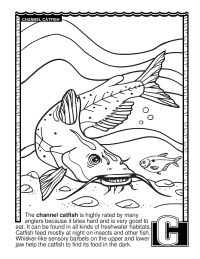 C is for Channel Catfish, from the Fishing ABCs Coloring Book. Created by the U.S. Fish and Wildlife Service. 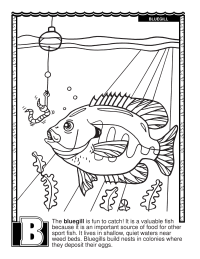 B is for Bluegill, from the Fishing ABCs Coloring Book. Created by the U.S. Fish and Wildlife Service. 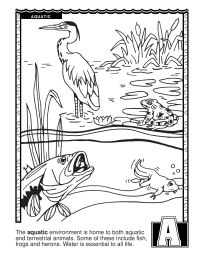 A is for Aquatic, from the Fishing ABCs Coloring Book. Created by the U.S. Fish and Wildlife Service.